This week is looking a little intense, but only a little – this too shall pass. Let’s get to the reading, darlings! LEFT: JUSTICE REVERSED. There could be a situation where some form of injustice, bias, or discrimination is becoming apparent. Someone is not playing fair – make sure it isn’t you. Actions and consequences are not matching up. The jerks get away with murder; the good guys have to clean sh*t up, and/or even get punished. Where is the humanity?! Hang in there, my chickadees. Not all is lost. Trust that the injustice around you is merely a passing phase – because it is. The next card says so. MIDDLE: THE STAR. At the heart of this reading is the card of hope and Divine healing. 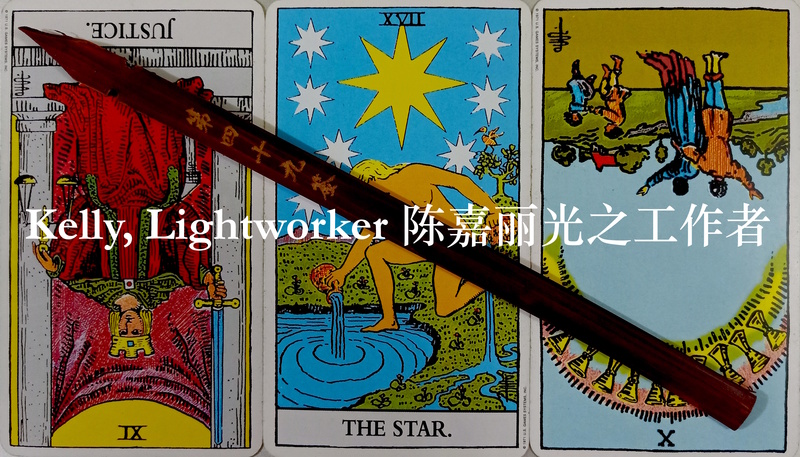 The Star in the Tarot represents the light at the end of a very long tunnel. It is a promise from the Universe: hold your head up high and keep moving forward. Your healing and breakthrough will eventually come. In my personal relationship with the Tarot, I’ve come to associate The Star with the Goddess Tara, the Swift One, She of Infinite Compassion, Wisdom, and Power. It’s not a coincidence that She’s appeared this week – I think a lot of us would benefit from praying to Her for deliverance from challenging situations. Click here to read more about how you can approach Tara for help. RIGHT: TEN OF CUPS REVERSED. This card is the Happy Ever After of the Tarot. Representing emotional fulfilment and harmony, this card still bears the potential for beautiful things – but in reverse, expect delays, setbacks, and possible disappointments with desired outcomes. But it’s still not the end. Be patient, and things will get better. This week’s Goddess divination lot explains how. In winter, the water turns into ice. Why fight so hard for good repute? Sit quietly. Wait for your winter to pass. All will naturally be clear. Some of you may be in situations where miscommunications are apparent, but fighting to clear your name or get your point across will only result in greater misunderstandings. If you’ve done your best. So leave it for now. Stay in your lane, do your own thing, and refrain from impulsive decisions. The situation will become clear eventually; when a favourable time arrives, then you can put your plans into action. Don’t allow impatience and frustration to overwhelm you, but choose to move forward with peace of mind and faith that things will work out if you hold back for a bit. People are going to be difficult – that’s the Venus retrograde. You do you.